I have a feeling that you guys are going to LOVE this chili. I’m not trying to toot my own horn or anything like that but I’m kind of proud of it. The blend of warming spices and hint of smoky flavor pairs perfectly with the tender nutty pieces of butternut squash. Plus, you can cook it on the stove top OR in a slow cooker. I made it both ways and they were equally delicious. So this might sound a little strange but the inspiration for this recipe actually came from a frozen burrito. There’s a locally-based brand that just started selling to my Whole Foods and I’m obsessed with the flavor combinations. My favorite is the smoky quinoa and butternut squash burrito which I thought might translate into a healthy bangin’ chili and guess what? It did. THE END. Alright, I guess there’s a little more to the story. For example, I noticed that one of the ingredients in the burrito was jicama. 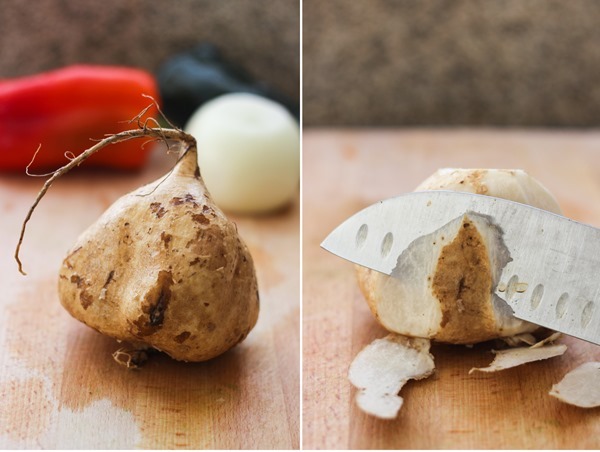 If you’re like me then you might be wondering, what the heckima is jicama? Jicama is a root vegetable indigenous to South and Central America and the name translates to mean Mexican yam. It’s high vitamin C content makes it great for boosting the immune system and aiding in anti-inflammatory reactions in the body. It’s high in soluble fiber but low in calories, sodium and fat which means it’s an ideal food for lowering cholesterol and aiding in weight loss. It’s also a good source of iron, potassium, calcium, magnesium, and vitamin B-6 which helps our body break down protein into usable energy and supports our nervous system. It might not be the prettiest of vegetables but you can’t beat the nutritional line-up. And it’s really easy to work with too. All you have to do is peel the skin off with a knife, chop it up and throw it in! I found the flavor to be very mild; it basically absorbs whatever you cook it with and the texture is slightly crunchy, kind of like watercress. If that doesn’t sound appealing to you or you can’t find jicama then feel free to leave it out. The rest of the ingredients are flavorful and nutritious enough to make up for it. Either way I hope you get a chance to give this one a try because it’s sure to keep your body warm and your taste buds happy. Enjoy! If you prefer the slow cooker method, simply place all of the ingredients into the slow cooker and then cook on high for 6 hours. Note: this method results in a softer texture of the squash. I prefer the stove top version but for the sake of convenience, the slow cooker version tastes just as good. If you are able to add the squash in the last 1-2 hours of cooking, that will help prevent it from being mushy. If you want to make it on the stove top, start by warming the olive oil in a large pot over medium heat. Add the onion and cook for 2 to 3 minutes. Then add the garlic, jicama, bell pepper, and poblano pepper. Mix in the spices (chili powder to ginger) as well as the liquid smoke, tomato paste, and Worcestershire. Stir together and cook for another 2-3 minutes. 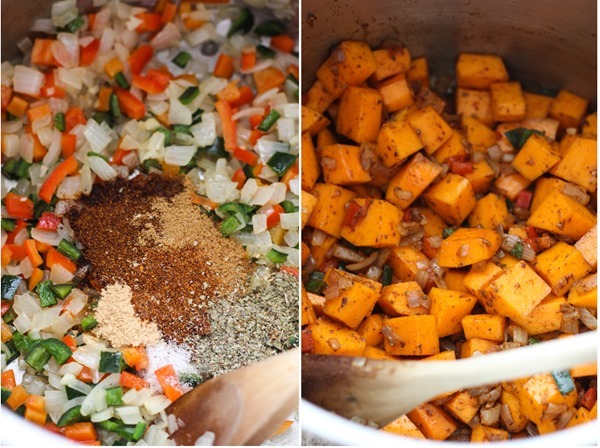 Add the butternut squash to the pot and stir together with the other vegetables and spices. Cook for 2-3 minutes then add the vegetable broth, quinoa, red beans and corn (optional). Bring to a boil then reduce to a simmer and allow to cook for at least 30 minutes. If the squash isn’t tender enough at this point, continue to simmer until desired tenderness is reached. 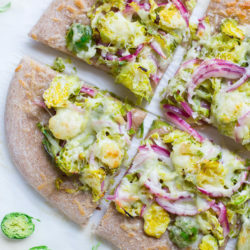 Serve warm with optional suggested toppings and enjoy! *Use vegan Worcestershire (I like Annie's brand) if necessary. **This recipe is written assuming you soak the quinoa in a bowl with water ahead of time. It is not a necessary step but I recommend soaking it for at least 6-8 hours to help aid digestion. If you want to skip that part then just rinse the dry quinoa and add an extra 1/2 cup broth when cooking. Comfort food at it’s finest. Looks delicious Sarah! I’ve never cooked with jicama but you have me intrigued. The first time I had jicama was when I was 16. An old lady across the street from my Grandma’s introduced it to David and I. I was never really a fan of it raw, but I’ve never had it cooked like this! I’d definitely give it another try. I love jicima when I do eat it, but I’ve never actually bought it myself. I’m totally craving chili now! Hell yeah for jicama!! Root vegetables are fabulous in chili – bravo, my dear!! And butternut squash makes THEBEST chili INALLTHELAND! ;) Let’s eat all of this! Yessssss. I love the sound of this chili! 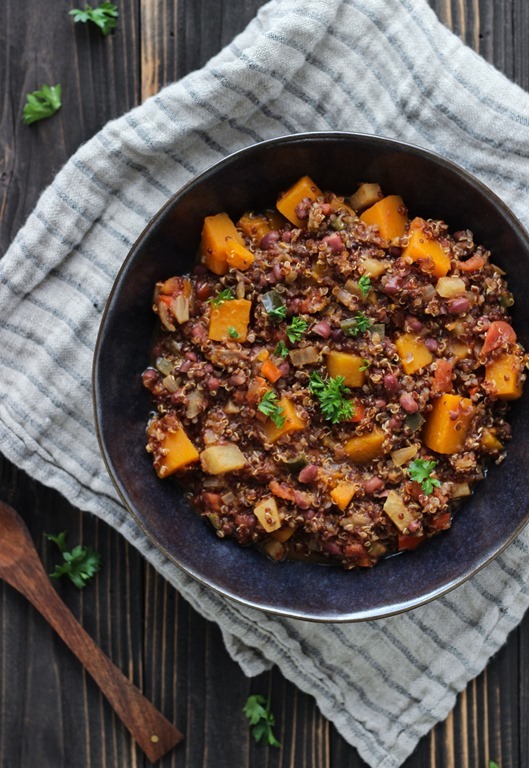 Butternut squash chili is my favorite in general and I love all the spices and everything going on here! I’ve had jicama before but never used it myself. Time to change that. Happy happy weekend friend! Sounds so tasty! Can you just mail me some though? My kitchen isn’t large enough for all these ingredients! Sounds crazy but I often can’t cook certain things or own kitchen tools because our kitchen is too tiny. 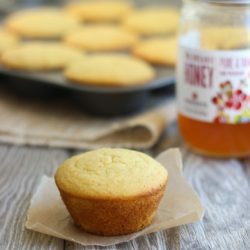 This will be on my list of recipes to try when we upgrade to a larger apartment in April! You’re the second person to say this looks too difficult to make but I promise it’s not! It’s made in one pot and the only tool you need is a knife to cut the veggies. The ingredient list just looks so long because of the spices. If you’re looking for a good spice holder, IKEA has these awesome little magnetic ones that I use and love. You can put them on your fridge to save space too. You know, Dave and I have been on the hunt for jicama to add to our Sunday night tacos, but have not yet found it. It’s not always available I don’t think. This dish sounds lovely, as usual. I have a reader request … could you make something a little bit easier? I would LOVE a slow cooker recipe with less ingredients, for someone like me to be able to whip up and impress others. Okay thanks. :) ahhaha!! Happy Friday! You’re so funny! This is actually pretty easy to make. If you buy pre-cut butternut squash then all you have to do is chop the peppers and onion and throw it in a slow cooker with the rest of the ingredients. The list just looks so long because of the spices. I think I just like saying the word ‘jicama’. Can you find them at Whole Foods? I’ll search next time. 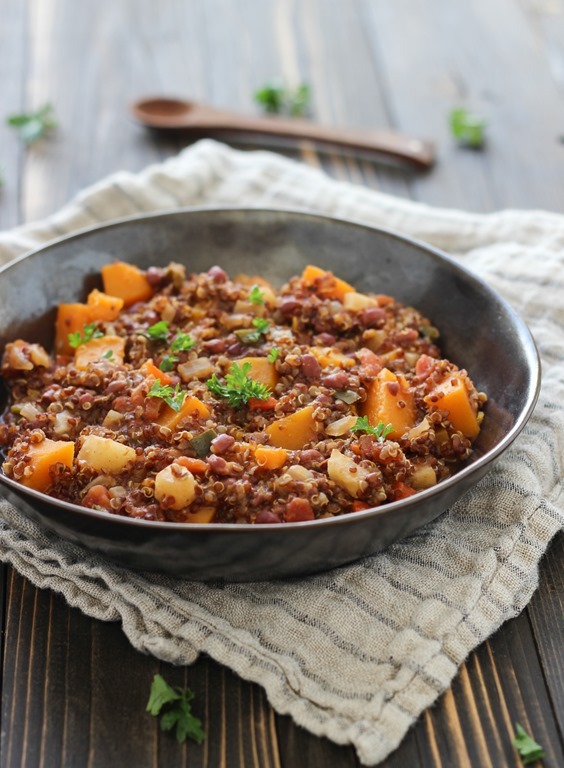 Loving the look and sound of this quinoa chili, love how you used liquid smoke as well – I just bought a bottle and have been wanting to open and use it.. this recipe is therefore perfect for me! A beautiful and nutritious dish. I would love to try jicama! I am a big chili fan and can’t wait to try your version! 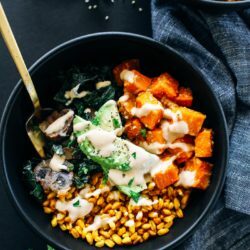 With all those warming spices, liquid smoke, and creamy butternut squash, this sounds like the perfect dinner on a winter day. I love jicama and don’t think it’s used often enough, so I was excited to see it featured in your recipe! Haha, love quinoa and chili so I think this is right up my alley. And jicama! The first time I tried jicama was when I worked at Trader Joe’s (they have this kind of snack pack with veggies). It’s really good, the texture actually being similar to a watery apple (if that even makes sense . . . ). Anyway, great post girl! Thanks, Aya! I’ll have to keep an eye out for the snack pack at TJ’s. It sounds really good! Wow this looks seriously delicious and so comforting!! This is lovely Sarah! I’ve been meaning to experiment with jicama for a while now, you’ve inspired me! Awesome, I love recreating great meals I’ve gotten out somewhere at home! Want to hear something nutty? I haven’t eaten ANY butternut squash this fall. I need to get one stat! You can just make it without the jicama! Or if you know of a mild root veggie that you have access to, you can just replace it with that. 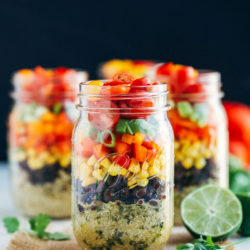 Love the use of real poblano and jicama, but wondering about the ratio of 1 cup raw quinoa to a medium butternut (~2cups). Especially when cooking the quinoa in the chili, not adding it at the end to guage the amount. A similar recipe calls for 1.5c squash to 1/4 c quinoa and states to add it during the last 45 min so not too mushy by slow cooker. 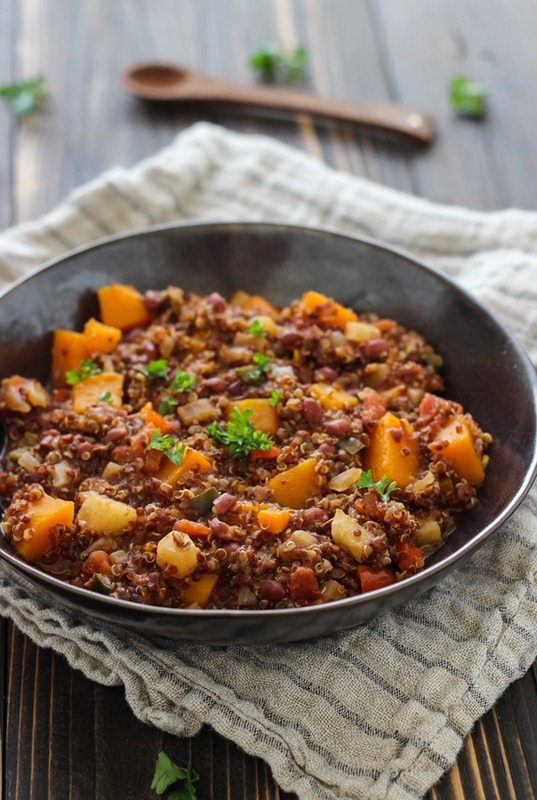 (http://www.thekitchn.com/vegetarian-recipe-black-bean-sweet-potato-and-quinoa-chili-166739) Appreciate any suggestions there? Hi John, great question! The link you attached is actually for a stove top recipe, not a slow cooker recipe. In addition, they’re using dried beans which take a long time to cook so that’s why they are adding the squash and quinoa at the end. For the stove top version of my recipe, the squash doesn’t come out mushy at all. It takes just as long to cook as the quinoa (when you presoak it) so it works out perfect. However, if you throw everything in a slow cooker, it does yield a softer texture to the squash. I prefer the stove top method for a firmer texture but for the sake of convenience, the slow cooker method still tastes great. If you’re worried about it being mushy, you can always add the squash in the last hour of cooking or cook it separately. I hope that helps! I love the Jicama vegetable. 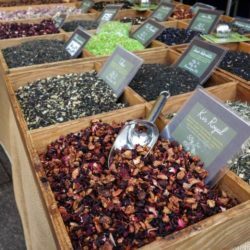 I use it finely chopped, raw, in place of apple or half and half with apple to make a healthier version of a Waldorph type salad or sandwich spread or dip…. I’d like to see what you come up with using it raw. Enjoy your blog very much. I am co-dounder and editor of a literary blog/ezine in its 20th year online. Although I have a regular cooking columnist, I do guest cooking columns from time to time. I’d be delighted to share your expertise with my international readers if you are interested. Check it out at pencilstubs dot com for ezine and pencilstubs dot net for the blog. Clicking an author’s byline will bring up their bio if they shared one with a list of what we have published of their work.